Are you a small business, charity or social enterprise? Need to increase your media profile? Want help with a launch event? Looking to develop a social media presence? After a friendly, experienced, proven company? Is your website outdated or non-existent? 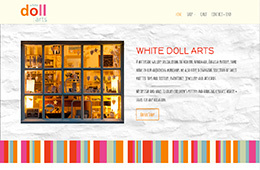 Want a site that’s sleek, fast, with wow factor, that does your business justice? Want professional photography with that? Optimised for all devices? But don’t want it to cost the earth? Photo gallery broken? Pics out of date? Layout gone wonky? Plugin stopped working? Abandoned by your web designer? Site just looks horrible? Simply stumped? Come to WordPress Angel for a one-off affordable fix. Rockpool Media have provided marketing and PR support for Ways with Willow, gaining us invaluable local press and radio coverage, and relaunching our website. 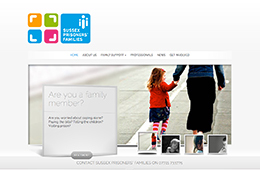 They are approachable, friendly and understand social enterprises and charities. If anyone wants a website built with minimum fuss that looks lovely and is exactly what you want, I’d highly recommend Rockpool Websites. My website looks more gorgeous that I could ever have imagined. I love the typeface. It’s perfect. WordPress Angel have been very helpful fixing problems with my website while meeting a tight deadline and arranging new hosting. Their efficient, friendly service has made it easy for me to keep my website up to date and running smoothly. are Sinead (press and PR) and Nick (web). Sinead grew up in Fowey, Cornwall: after-school evenings on the beach, sand in her hair and dodgy tales of Gossips ‘nightclub’. Nick (though it was hardly his fault) grew up in Hampshire. Both moved to London to find their fortunes, Sinead as a press officer, working with charities and social entrepreneurs, Nick as a journalist (Daily Mail, Guardian, Times Magazine, Radio Times) and author (Dalek I Loved You). 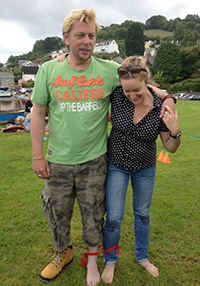 After meeting over a love of karaoke and pub quizzes, they waved goodbye to the city for Fowey with their baby daughter, Regan (named after John Thaw’s character in The Sweeney), so she too could have afternoons on a beach. Fortunately for them, Gossips has shut down. They set up Rockpool Media in 2012, with the aim of helping the many small businesses that Cornwall’s economy relies upon. Sinead’s expertise with charities and social entrepreneurs means she can also offer those organisations her services. Nick retrained as a WordPress web designer and has never looked back. Their connections are many and varied. Sinead’s CV includes: The Big Issue, Jamie Oliver’s Fifteen Cornwall, The Prison Reform Trust, UnLtd: the Foundation for Social Entrepreneurs, Institute for Public Policy Research, MP for North Cornwall, UpMyStreet.com. Nick’s selected website portfolio can be found here. Between them, they also founded and run Love Fowey, promoting their hometown and its businesses, as well as campaigning on their behalf, and running the Fowey Fringe comedy event. Our founder Sinead honed her skills in London with charities including the Big Issue and the Prison Reform Trust, as well as a stint in the House of Commons. She understands what it takes to gain a journalist’s ear and to convey a message to the public. 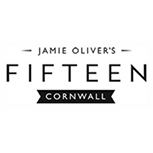 More recently Rockpool organised a high profile graduation event for Jamie Oliver’s Fifteen Cornwall which was staged at the Eden Project. 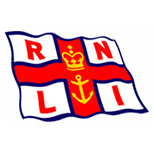 We also handle fundraising communications in the South West for the RNLI and are working on an event for Cornwall Community Foundation. 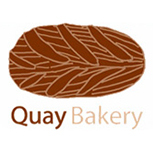 Rockpool organised the launch and ongoing press support for the Quay Bakery in Fowey, which has exceeded all sales targets in its first year. We were also instrumental in setting up Love Fowey, a website and social media presence for over 80 local small businesses, and Crafty Cornwall, which aims to link courses with accommodation providers. Via Rockpool Websites, we have worked with numerous small businesses, from Fowey Aquarium to Any Old Lights, to enhance their web presence. Sinead has worked for two of the UK’s most successful social enterprises – The Big Issue and Jamie Oliver’s Fifteen Cornwall. She was also the South West Development Manager the UnLtd, the Foundation for Social Entrepreneurs, and has excellent links with the School for Social Entrepreneurs in London and Cornwall. Rockpool have built websites for CICs such as Maker Junction and are currently handling press for Safer Stronger Cornwall. Sinead is a Trustee for RJ Working, a restorative justice CIC. Registering a domain name’s easy enough. Less easy is deciding on that domain name – not only does it need to sound right, and ideally say what you do on the tin, but it also affects how easily search engines spot the key service you’re offering. That takes a few online research tools and a little lateral thinking – we can do that for you. Besides a domain name, you’re going to need hosting – essentially a server where all your website files sit. We offer that, too, at very competitive rates, including ongoing support if required. If you have a site at other hosting, we can also switch it to ours. We can build your site from scratch, involving as much of your input as you wish. We’re talking images – we offer discounted professional photography through partners, as dark, unfocussed photos ruin even the swishest website – the site architecture, aka what pages go where; logos and branding; colours; fonts; social media (Twitter feed or just links to the main players? ); links… You want an online shop? An events calendar? With booking options? Newsletter signup? Paypal donations? Anything’s possible. We offer the complete solution – and we don’t charge the earth, as agencies would do. We touched on it back there. And it’s an exhaustive subject in which the goalposts are ever-moving, but essentially SEO determines how high up the search engine rankings your website travels, and how fast. Mainly, your content needs to be genuine, well-written and relevant – not packed with phrases glibly repeating your keywords. We can insert a clever little bit of software into your website and prime it with good stuff, to give you a helping hand. For a cheap one-off fix of specific site woes, try our WordPress Angel service. Our latest build. This multinational supplier of components to the leisure industry wanted a multilingual site – a first for us at Rockpool. We researched the options, settled upon the WPML plugin and implemented that in a Divi-themed site, with plenty of CSS design styling. Want multilingual too? No problem! 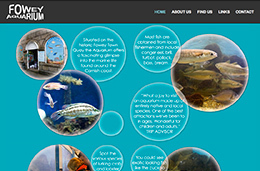 Our small but perfectly formed local Aquarium had no web presence. Rockpool registered their domain name, reassured the technophobic owner, Phil, that everything was possible, and built this site – based around a lovely bubbly homepage packed with images and enticements, perfect to attract families to this wonderful Fowey institution. Our delightful local pottery has such a unique atmosphere, we wanted to capture it in our design. Cloning colours from the logo, commissioning professional photography and using a texture that mimics the shop’s exterior walls, we achieved that perfectly. Having taught the client how to upload items to their shop section, they’re stocking away! 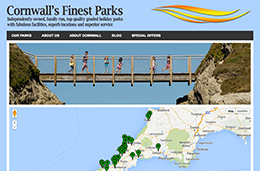 Cornwall’s Finest Parks’ website was a little dour-looking, so they called in Rockpool. 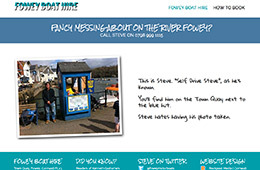 We created this database-driven site, using the same WordPress theme we used for our own Love Fowey. It’s packed with user-friendly features and adapted to CFP’s precise specifications. “We love it!” they declared on first sight. 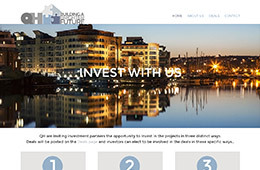 Our client started with a business idea based around property partnerships, no website, no domain name, no logo, no email account – just a few visual ideas and a desire to get moving. We love a challenge. Three weeks later, he was up and running with this gorgeous scrolling website that knocks spots off his competitors. Another overdue website upgrade. The client provided a small portfolio of ideal photography, which with a little online detective work we sourced, then added a palette of pleasing clinical colours. We integrated a lovely full-page Google Maps section and coded a professional-looking email footer that included his logo. “Awesome!” he enthused. 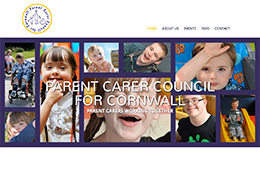 The Parent Carer Council for Cornwall’s old site had been built using the web-host’s free web-builder software. Rockpool’s new WordPress version looks clean and modern while delivering the key messages and information, as well as adding Mailchimp newsletter subscription and an Events calendar. 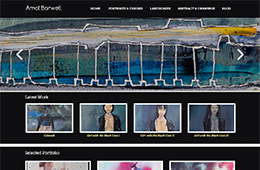 Amal Barwell is a French artist living in Cornwall who wanted a visually arresting website that matched her art. Rockpool sourced her domain name then produced a stunning site packed with slideshows and galleries, based on Amal’s colour schemes, as well as setting up her Twitter feed, attaching it to her site and teaching her how to use it. Steve, who runs our local self-drive boat hire business, came to us to deliver a new website that would attract families – the bulk of his business – in a simple yet effective way. We played to the postcard-feel of the images with this slider-based site that tells the user everything they need to know, in an appealing manner. Steve’s very happy! 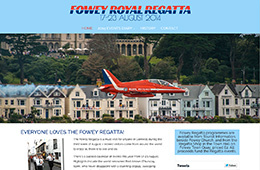 We love Fowey’s annual Royal Regatta – as do thousands of visitors. Their website didn’t do the event justice, so we offered a rebuild. We partnered with local professional snapper, Justin Mitchell, to splash with an iconic Red Arrows image, added photo gallery and diary. The site was ready for relaunch in little more than a day. 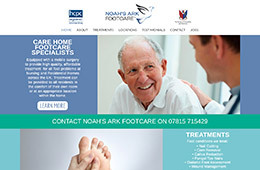 We first designed the very simple yet effective website shown above, which the client loved. Then they decided they wanted their blog and Twitter feed on the homepage – no problem! 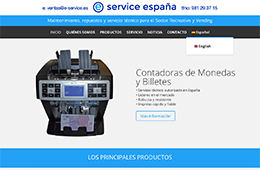 We switched themes, played around with the images and very quickly they had an all-new website, with the minimum fuss. 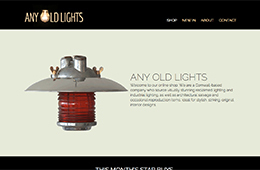 Another ecommerce website, selling industrial and reclaimed marine lighting. Plenty of image manipulation required for this cool, metallic site – but the coup was, with Search Engine Optimisation trickery, to get the client onto the front page of Google for his keywords, within three months of launching. The sales swiftly followed. Rockpool Websites build WordPress websites. Our WordPress Angel service offers one-off fixes and alterations of existing sites. If your photo gallery has stopped working, or your contact form no longer contacts, or you’d just like to change a few images, this is the service for you. Contact us outlining your site issues. We’ll get back to you with an estimate of how long the fix itself will take, and an estimated cost. We aim to complete all fixes within 72 hours. And don’t worry we always use plain English, not APIs, PHP and DIVs – we hate jargon! Check out our pricing structures below. We price a job based on the first full hour then quarter-hourly afterwards, so you’re not being charged for chunks of unused time. Especially if you’ve ever been tied into a long-term service contract, you’ll see how good our rates are.